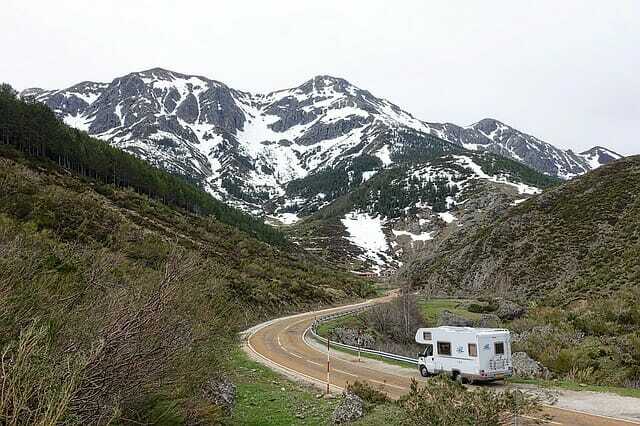 Different motorhome types offer huge variety and price ranges. Classes of motorhomes labeled A, B and C. Diesel and gas. Let’s break it down. Class A’s are built on a specially-constructed chassis designed for motorhomes. Lengths range from 26 – 45 feet. Slide-outs are common. Pushing a button makes part of the room slide out, and voila!, you have more space. Newer models have as many as 4 slides. The “home” part of the motorhome includes its own heating, air conditioning, electric system, propane supply, and water tanks (fresh water, grey water, black water). Accommodations include all the essentials – kitchen with microwave/oven, fridge, cooktop, dining area, living area, bedroom and bathroom. Washer/dryer may be standard or an option (or you can use the space otherwise – based on your lifestyle). It’s pretty standard to have a VCR and two TVs (living and bedroom). Flat screen LCD TVs are becoming common at the high end of the spectrum. The further you go up in price, the more bells and whistles – hydraulic leveling systems, electric awnings, heated ceramic tile floors, dishwashers, trash compactors, automatic sunscreens, GPS, and so on. Class A motorhomes include gas or diesel-powered. The diesel varieties are generally more expensive than gas, and are called diesel pushers – meaning the diesel engine is in the back of the motorhome (diesel pullers described below). At the most luxurious end of the range, Class A motorcoaches are called highliners. And at the top of the heap, and some would argue in a class by themselves, are totally custom coaches like the Prevost. Suffice it to say that there is a wide array of choices, floor plans, and interiors ranging from practical to luxurious – with corresponding price tags from $60,000 to over $600,000 to the millions of dollars. Class B’s are built on a van chassis with an elevated roof, so you can stand up inside. Lengths range from 17- 19 feet. Accommodations are tucked inside – usually cooking facilities, sink, small fridge, convertible bed/dinette, toilet, fresh water and waste water tanks, and electric outlets. Interior space can be limited, so these are not for large groups or extended living. But they are workable for a couple, and for overnight stays or camping trips. One of our readers (a couple who spends 3-6 months at a time in their class B), has observed that when they pull into a campground, they have many people interested in their Class B, and hear comments like “with less space, you have everything one needs and great gas milage (22-25mpg diesel)”. There is growing variety in designs and models of this motorhome type. Prices range from $40,000 – $100,000. Bottom line: The Class B motorhome type offers versatility and fuel economy. They can easily maneuver around town and tight rural spaces, serve as a second family vehicle, and can be used for light towing. Class C’s are built on a regular automotive chassis with both driver and passenger side doors. Lengths range from 22-35 feet. In addition to a regular bed, they usually have a bed over the cab (hence they are sometimes called a “cab-over” motorhome). Slide-outs are common these days, extending the living space. These tend to be scaled down versions of a class A. The home has its own heating, air-conditioning, plumbing and electrical systems. And typical accommodations include kitchen with microwave/oven, fridge, cooktop, dining area, living area, bedroom, bathroom, washer/dryer, VCR, TVs, etc. Optional features vary by manufacturer and model. Prices for a Class C range from $50,000 to $150,000. Bottom line: The Class C motorhome type offers smaller sizes and price tags often attractive to new and/or budget-minded RVers. Its cab-over bed extends sleeping quarters for families. And it has the motorhome convenience of being able to access your living space while on the road. These motorhome types have a diesel engine up front, in a truck-like cab with driver and passenger side doors. The diesel puller looks more like a truck, while the diesel pusher looks more like a bus. There is a lot of variation in this new form of RV. Numerous manufacturers offer an assortment of choices ranging from a 16-foot Class B van-type to a huge 45-foot Class C motorcoach. Bottom line: Another example of the constantly changing RV world, from which you can create your RV lifestyle. Your best bets to learn about motorhome types, or narrow down what’s right for you? Visit the RV shows and some local dealers. Explore manufacturer and dealer websites to check out different models and classes of motorhomes. You have to see these things.